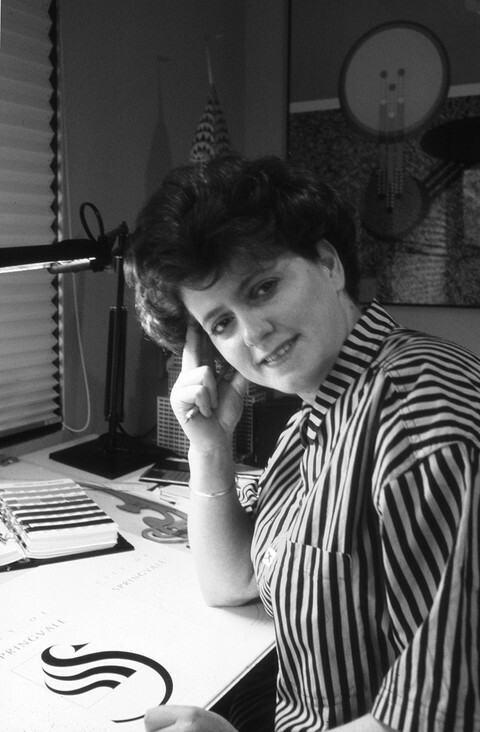 Lynda Warner pictured in her studio, c. 1989. Lynda Warner has been a significant figure in Australian graphic design for over three decades. Though her reputation was forged as a Tasmanian, she was originally from Melbourne. Brian Sadgrove identified her promise when viewing her final year folio at Swinburne University. He gave her a job, and, for three years mentored the impressionable Warner. ‘Brian’s influence on how I see things and how one approaches design has been immeasurable’, Warner has said. After a brief stay at another studio, Warner met a group of architects, Clarke Hopkins & Clarke, and became the firm’s in-house graphic designer, a rare thing at the time. The work included marketing material and, most significantly, large-scale signage projects. In 1982, she began her own studio, sharing space with the architect Keith Streames. Fortuitously, an importer of Japanese products, Spiral Foods, were neighbours. The owner, James Wilson, asked Warner to translate some labels into English, and so began a relationship which would endure of for the next few decades, providing Warner with some of her most recognisable work. In 1983, Warner relocated to Tasmania, a virtual design wilderness at that time. Building from her existing Melbourne client base, she was able to gradually develop a steady stream of work. Her portfolio reflects her love for art and architecture, often receiving payment in artwork in place of fees. In 1997 Australia Post commissioned her for what would be the first of many stamp designs. The series designed to promote four facets of Australian Design is perhaps her most well-known. She was one of eight designers invited to contribute a poster design for the 2000 Sydney Olympics. The other seven were men. Her response says a lot about her no-nonsense approach to her discipline: ‘Who cares; as a lover of this event it was an exciting challenge’. A project which combines her love for the built form with graphic design, is a magnificent three-dimensional type-based interpretive walk on the Burnie foreshore. The Pulp Paper Trail was designed to honour the men and women who came from and to the North West Coast of Tasmania to work at Burnie’s pulp and paper mill between the years of 1937 and 2010. Of it, she wrote: ‘This is a job that probably covers off all that I have learnt over the years, indulging the frustrated architect within me, a love of typography and the opportunity to collaborate with like-minded people who have enriched my vision… and all standing proud against a beautiful open space’.